Autumm Caines reflects on her personal experiences with an edtech professional organization and as an edtech conference attendee. An important set of considerations and timely to share as #ISTE17 kicks off. We asked Matthew Hickey, a security researcher and co-founder of cybersecurity firm Hacker House, a simple enough question: Will ransomware install on this operating system? It took him a little over three hours to bust the operating system's various layers of security, but he got there. "I'm honestly surprised it was this easy," he said in a call after his attack. "When I looked at the branding and the marketing for the new operating system, I thought they had further enhanced it. I would've wanted more restrictions on trying to run privileged processes instead of it being such a short process." Five years after the Sweetwater Union High School District board spent $4.5 million to put iPads in the hands of seventh graders, nearly all of the Apple tablets are classified as out of inventory, lost or stolen. Today, XPRIZE, the world’s leader in designing and managing incentive competitions to solve humanity’s grand challenges, announced 11 semi-finalists advancing in the $15M Global Learning XPRIZE. “Finalists will be required to open source both their code and their content, which will be free and available for anyone to build on." Graham Brown-Martin writes, "So my point is that the Edtech bubble has burst and that’s a good thing because it had got rinsed by dumb money in the hands of even dumber people making bad bets to reinforce a status quo in education that should have been killed off last century." Toward a comprehensive timeline of key papers in the history of Open Education. Researcher Bernadette Doykos surveyed Maine’s schools and found that even though every district receives devices, the way they’re used tends to be different in high-income and low-income areas. And rural schools face special challenges. This is an ad, but offers some useful content. 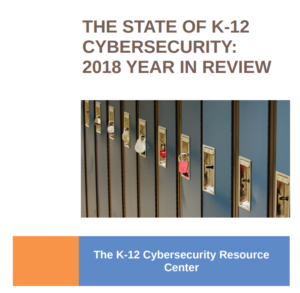 Lessons for school districts include: (1) You must address cybersecurity. (2) Cybersecurity is NOT just an IT issue. (3) Litigants are waiting and watching. Autumm Caines writes: "I was questioning the framing around the professional development I was getting and now, after hearing other colleagues similar concerns, it just feels so relevant that I can’t hold back." Mike Caulfield quotes Klint Finley’s list of the "freedoms people actually want: (1) Freedom to run software that I’ve paid for on any device I want without hardware dongles or persistent online verification schemes. (2) Freedom from the prying eyes of government and corporations. (3) Freedom to move my data from one application to another. (4) Freedom to move an application from one hosting provider to another. (5) Freedom from contracts that lock me in to expensive monthly or annual plans. (6) Freedom from terms and conditions that offer a binary “my way or the highway” decision." The Regulatory Reform Task Force has been tasked with providing recommendations on which regulations to repeal, modify or keep in an effort to ensure those that remain "adequately protect students while giving states, institutions, teachers, parents and students the flexibility needed to improve student achievement." On the list of regulations to be modified: FERPA and PPRA. Facing the need to repay $60.4 million from the 2015-16 school year and potentially millions more from last school year, ECOT says it will lay off 350 workers within weeks, about a quarter of its workforce. Two former Miami-Dade school students claim the Miami-Dade County School Board was reckless and negligent for publishing students’ private information on the Miami-Dade County Public Schools (MDCPS) website. "Information such as social security number, developmental scale score, whether they passed or failed the FCAT, achievement levels and other test scores." After Debian 9 release, the Debian Edu distribution, which is also called Skolelinux, has released its new version, i.e., Debian 9 Edu. It’s focused on students and schools who wish to install servers, workstations, and laptops for collaborative working. One approach is to offer educational content free, available to anyone with an internet connection and to impose no financial requirements on students. The other seeks to Disney-fy education for a fee. Schools are paying a lot more attention to what students post online, and that can have severe consequences for students and schools. But monitoring online behavior is difficult, and civil rights groups are watching. Says the ACLU's Chad Marlow, "Once you start policing and punishing thoughts, you are into very, very dangerous territory." Google tightly controls the hardware and software, and "does a great job of integrating security features (verified boot, immutable OS images, encrypted filesystems, etc) in default configuration." However, "if you include ‘privacy’ in the topic of security, then Chrome OS/Google presents a unique set of challenges." So there’s the choice in black and white: privacy, or security, but not both. Philanthropy is increasingly sliding into the driver’s seat of public life, with private funders tackling problems that government can’t or won’t. Yet as a deluge of new wealth pours into civil society, we should also be asking who gets heard. Is it just me or is this piece - and I am being kind here - ‘convoluted'?